Wing FTP Server For Linux(64bit) is a highly functional, easy-to-use and secure FTP Server solution that can be used in Linux(64bit). Wing FTP Server For Linux(64bit) supports a number of file transfer protocols, including FTP, HTTP, FTPS, HTTPS and SFTP, giving your end-users flexibility in how they connect to the server. And Wing FTP Server For Linux(64bit) provides admins with a web based interface to administer the server from anywhere. ...... You can also monitor server performance and online sessions and even receive email notifications about various events taking place on the server. * Uses the Lua scripting tasks to appoint an action at a specified time. * Executes Lua Scripts, sends out emails and implements third-party software. 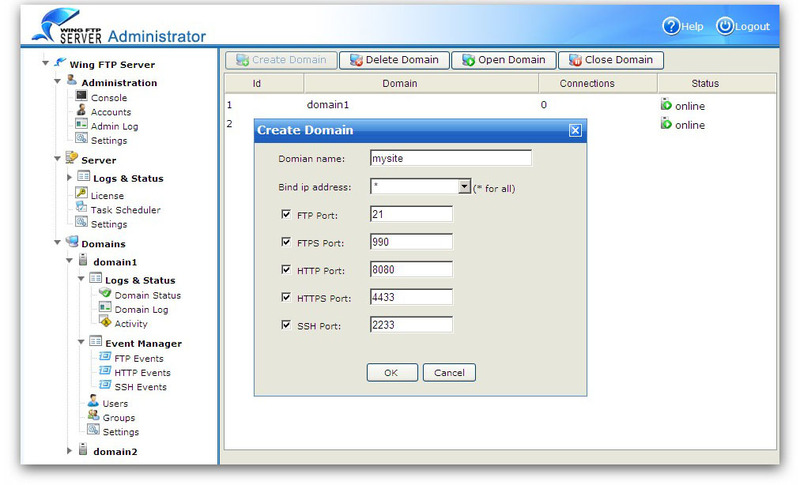 * XML files, ODBC database, Mysql database, LDAP and Windows Authentication (NTLM or Active Directory). * Provides a set of APIs that can be called in Lua Scripts. * Allows you to map virtual directories to physical directories, and you can also use UNC path or mapped drives for virtual directories. Qweas is providing links to Wing FTP Server For Linux(64bit) 4.1.1 as a courtesy, and makes no representations regarding Wing FTP Server For Linux(64bit) or any other applications or any information related thereto. Any questions, complaints or claims regarding this application Wing FTP Server For Linux(64bit) 4.1.1 must be directed to the appropriate software vendor. You may click the publisher link of Wing FTP Server For Linux(64bit) on the top of this page to get more details about the vendor.